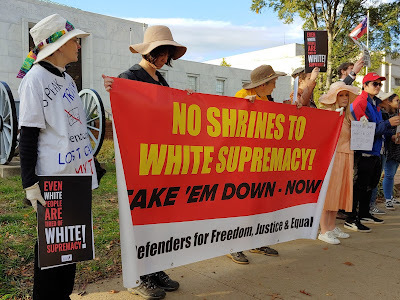 RICHMOND, VA, Nov. 4 -- More than 50 antiracists from Charlottesville, Durham and Richmond gathered today outside the headquarters of the United Daughters of the Confederacy on the Boulevard in Richmond to demand that the organization stop defending monuments that glorify the slavery-defending Confederate States of America. More than any other organization, the UDC has been responsible for promoting the myth that the Confederacy represented a noble cause, that slavery was not the cause of the Civil War and that slavery itself was a benign institution in which enslaved Black people happily toiled for benevolent white masters. While best known for its work in promoting the building of Confederate monuments throughout the South - and in most states in the country - it was the work of the UDC in policing history textbooks that had the greatest effect in promoting the organization’s distorted views. Generations of white Southerners grew up believing in the nobility of the Confederate cause, a belief system that predisposed them to defend racial oppression, including Jim Crow segregation and racist violence. Of the dozens who protested outside the UDC headquarters today, a majority were white Southern women, a hopeful sign for the future. Among the groups attending today’s protest was the Virginia Defenders for Freedom, Justice & Equality, which helped with logistics and security. Story and more photos on Facebook.